As you know, the email subject line is one of the most critical elements of an email campaign. After the sender’s name and reputation, the subject line is the key driver of email open rates. So nailing your subject line copy has to be your most important priority. For many marketers however, subject line writing is often hit or miss. There’s no clear and consistent methodology that can be easily reproduced from campaign to campaign. Marketers rely heavily on instinct and then use AB testing to “optimize” – or at least pick the better subject line. Successful marketers make email subject writing a priority. And have guidelines for writing more effectively. But some smarter marketers are taking subject line optimization a step further by leveraging the power of Artificial Intelligence. More specifically, using emerging cognitive tone analysis tools – including IBM’s Watson Tone Analyzer– to recognize patterns in what works best for their audience. Tone analysis looks at your subject line or text and determines the tone of that copy. To do so, it looks at things like sentiment, emotion, social tendencies and language style. These characteristics are typically displayed as a series of graphs showing the degree to which your copy scores on each of these attributes. In order to leverage AI tone analysis, the first step is to look back at your top performing emails for the last 12 months. Find the top 10 or so campaigns: the ones that had the highest open rates. You will want to filter out those that were driven by factors other than the subject line: thinks like transactional messages, email confirmations, etc. as these will skew or obscure your results. You may also want to do this exercise separately based on platform (mobile, desktop, tablet) since the number of visible characters (and therefore the visible portion of the subject line) differ significantly. 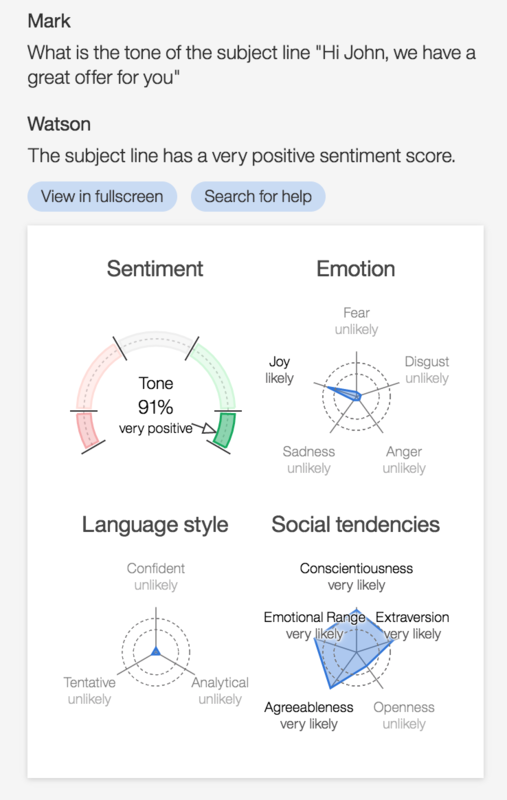 Run each winning subject line through your AI tone analyzer to get a better understanding of what types of sentiment, emotion, style and tendencies work best for your product or audience. In this example (on the right) the subject line “Hi John, we have a great offer for you” has a very positive sentiment score and conveys Joy. The style is very neutral, and it offers a strong variety of social tendencies including extraversion, conscientiousness, agreeableness, etc. Do you see a pattern emerging? Is the sentiment positive or negative? Sometimes negative sentiment (including the fear of missing out) isn’t a bad thing. Often, it drives better conversion because of the sense of urgency it creates. These attributes will become your subject line copywriting benchmark going forward. It’s important to note that high-performing subject lines may differ in nature depending on the type of email you’re sending: a newsletter, a flash sale, an information piece or an offer may all require different subject line tones. Even without the help of AI, you should see certain patterns in the subject line structure and content. Do they have something in common, such as the use of personalization, the presence of an action verb at the start, the offer or discount, use of a question, etc. What was displayed at the start of the subject line? Did it include an important benefit? What can you learn from these patterns to help you write your subject lines in the future? Next practice what you’ve learned. Armed with an understanding of what has worked best in the past, you are now all set to do much better in the future… right? Well, not so fast. Now you have a benchmark, but you need to get really good at writing to that benchmark. For your next campaign, draft a dozen subject lines that you feel are close to the historic winners. Then run them through the AI tool again. How well did you score against your benchmark? Were you able to capture the same emotional range and sentiment? If at first you don’t succeed, get back at it! Once you have handful of candidates, you can ABC test the top three subject lines in a live campaign. And see how well they did in real life. Did the new AI enhanced copy provide a better than average lift over your average results? If so, great. If not, get back to the drawing board: you may have missed something. Of course, a well-trained AI should eventually be able to draft and recommend a series of optimized subject lines based on its analysis of historic performance. But where’s the fun in that? Besides, you still have to train it. And if your subject lines are poor to begin with, your historic results won’t be much of a guide. So, subject-line writing still remains an art. But with the help of a little science, we can get a little better at what we do. Mark Morin brings brands and people closer through relationship marketing, email, cognitive and automation. He is the founder and CEO of strategies.ca, a marketing collaboratory located in Montreal, Canada.